If necessity is the mother of invention, then Tijuana is where she gave birth and raised her kid! FRONTIER LIFE digs into this strangely inventive city for stories of car worship, street racing, water flow, emergency architecture and a vibrant electronic music scene. 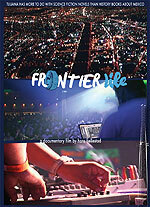 Buy the DVD from our online store now and get a FREE copy of the Frontier Life soundtrack!